Saturday, May 19, 2018 ~ 10:00 a.m.
Friday, May 18, 2018 ~ 6:00 – 8:00 p.m.
Eugene C. Wills, 73, of Ashland, NE, died Tuesday, May 8, 2018 at Gretna Community Living Center in Gretna, NE. He was born on June 11, 1944 in Lincoln NE to Clarence E and Ila M. (Wallinger) Wills. He grew up on a farm in Ashland with his parents and sister, Gwen. 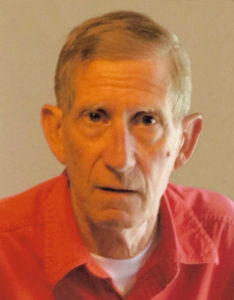 Eugene graduated from Ashland High School in 1962. Eugene was married to Teri (Pike) Pierce for 18 years until they were divorced. Teri and Eugene had two children together, Brenda and Daryl. On July 4, 1997, he was married to Sandra Schulze. He worked for Standard Station for a few years and he spent 38 years working for Western Electric until his retirement in 2004. Eugene enjoyed spending time with his family, especially his grandchildren. He also enjoyed watching softball games, camping with family, fishing, trap shooting, watching his race horses, Husker football, mowing and caring for his yard. He is survived by wife of 21 years, Sandra Wills; children, Brenda (Kevin) Gautier of Aurora and Daryl (Julie) Wills of Ashland; grandchildren, Lauck Gautier, Jessica Gautier and Cleo Wills; step-grandchildren, Marcus Sikora, Paul Thomas Wright and Luke Richard Wright; great-grandchildren, Lucas, Noah, Grace, Bryce, Zoe, Willow and Ava; step-children, Mardra (Quinn) Sikora of Omaha and Tim (Lisa) Wright of Omaha; sister, Gwen Hightshoe of Ashland. He was preceded in death by his parents, Clarence and Ila Wills. So sorry to hear about Gene. Always enjoyed visiting with him. Hold close all the great memories. Thinking of you all. condolences to family, I have found memories of Gene, playing football with him in high school and visiting with him at gun club.